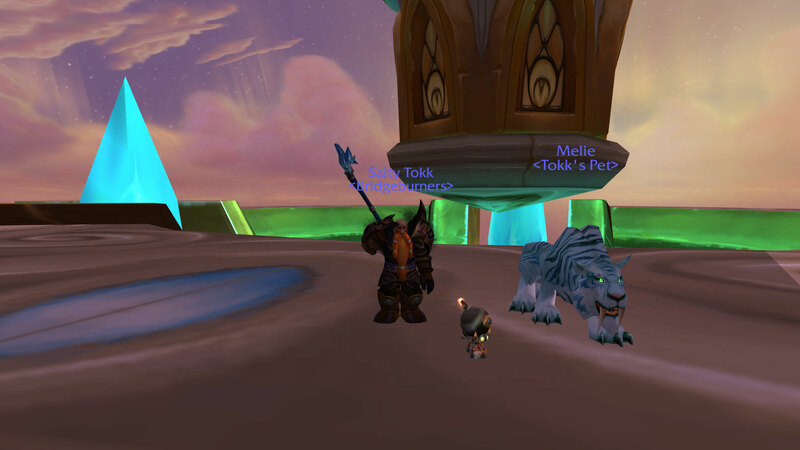 The second of our guest posts this week comes courtesy of a personal friend of mine outside of WoW. Tokk is a long standing member of the Bridgeburners guild on the Emerald Dream realm. Due to my own forced raid break, I was left somewhat stumped when people began requesting strategies for the Ruby Sanctum. When I finally decided to approach a third party to produce the guide, Tokk was my first choice. 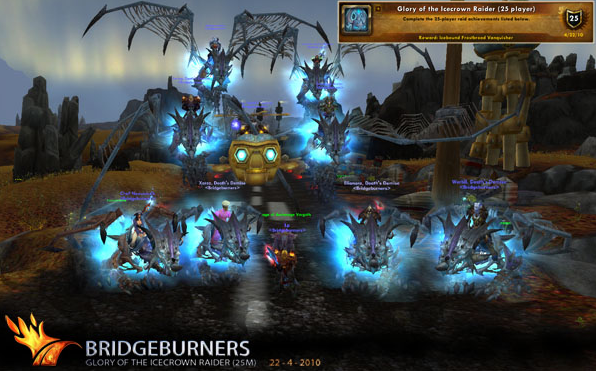 Bridgeburners are currently EU ranked 248 (world rank of 476) and the leading PvE raiding guild on the Emerald Dream realm. With their status as the realm’s leading guild secured, they offer realm first achievement and title kills to all their members. They’re also recruiting! Interested parties should head over to their forums to read more about this lovely group of people. Today Tokk (with the assistance of his amazing guild) are bringing us an insight into the tactics and strategy involved in a successful Ruby Sanctum raid. It’s time to take a closer look at the latest member of the elemental-breathing, tail swiping, angry lizard familiy, Halion The Twilight Destroyer. In this post we will discuss his various phases and abilities across all modes and difficulties, but the tactics below are meant for the 10-man Heroic version of the fight. The entirety of the fight takes place within the big circle in the middle of the Ruby Sanctum where Halion spawns. Once you engage him he will wall it off from the rest of the zone, so make sure you don’t linger too long on the edge when pulling. Other than that the fighting area remains static for the duration of the fight. As with all dragons Halion uses the draconic hallmark abilities of frontal cone breathing, cleaving and tailswiping. 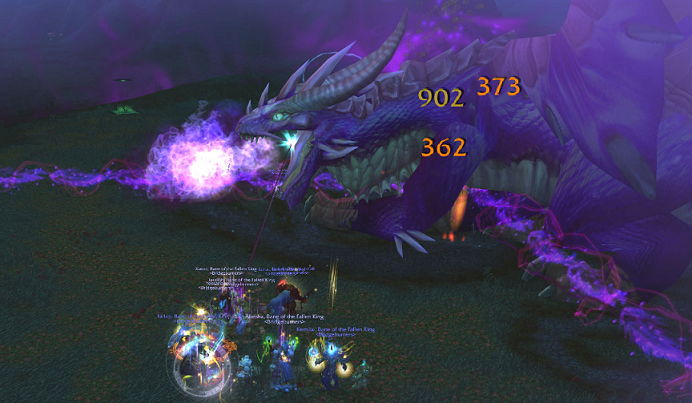 The breath attacks occur in all phases and will usually kill non-tanks in a single hit. The tailswipe this time around is a knockdown stun that lasts for about 3 seconds, so be very careful not to get hit as it can be lethal throughout the fight. This ability is cast roughly every 20 seconds and puts a debuff on the target that ticks for 4000 damage every 2 seconds and builds up a counter every time, lasting for 30 seconds. Once the debuff wears off, is dispelled or the target dies, it will explode knocking nearby players back and placing a void zone type damage circle on the ground that leaves a DoT on anyone who stands in it. The size of the circle depends on the amount of stacks the initial debuff has ticked up to. The circle lasts for 40 seconds. Going through any kind of portal with the debuff on you will cause it to be dispelled on top of the portal, so be careful! The second ability used in the first phase is used every 35 secons and summons a large meteor from the sky to hit the ground beneath a random raid member. Anyone hit by it is prone to death by fiery squishing, so make sure to move out of the area. When it lands it will also spawn 4 trails of fire that arcs out and around the zone dealing moderate damage to people standing in them. The only change in phase one happens in twenty five man heroic mode. When the meteor strike hits the ground it will spawn a large fire elemental called Living Inferno and eight smaller elementals called Living Ember. The big one has a short range fire damage aura, so should be tanked away from the bulk of the raid. The small elementals will gain a stacking buff that makes them grow bigger and stronger whenever they stand near the Living Inferno. When his health reaches 75% Halion will vanish into the Twilight Realm and start phase two. A portal will spawn on his location that you will have to enter through. This ability works exactly like Fiery Combustion did in phase one, with two exceptions. Firstly the circles will slow anyone who stands in them for a few seconds every application. So even when you get out you will still be slowed for a few seconds after. 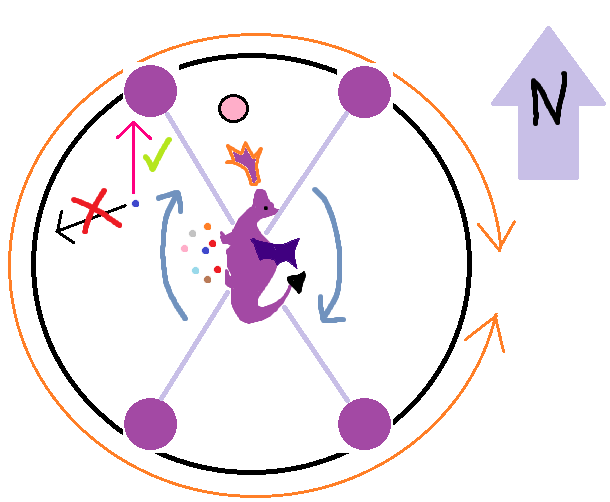 The second difference is that instead of knocking away nearby players, it will pull them into the circle. The only other ability used in phase two is the Twilight Cutter. Around the edge of the fighting area in the twilight realm two orbs will slowly go around clockwise. Every thirty seconds they will lock a beam between them that oneshots anything it touches. The change in phase two applies to both the ten man and twenty five man heroic versions. Instead of there being two orbs circling the room there will now be four, effectively splitting the room into quardrants every time Twilight Cutter is cast. Upon reaching 50% Halion will give a short speech and enter phase three, spawning two portals in the twilight realm (to the north west and south east) that lead back to the physical realm as well as two in the physical realm leading to the twilight (north east and south west). The third and final phase consists of everything from the first two phases happening at the same time. Halion will be active in both the physical realm and the twilight realm. Having no players in either realm will cause him to regenerate 2% hp every two seconds. On top of that, Halion will now display a corporeality percentage. It starts at 50% for both realms and will change in increments of ten depending on how much damage is done in either realm. Every time it increases Halion will deal 30% more and take 20% more damage and when it decreases Halion will do 30% less and take 20% less damage, so keeping it between 40% and 60% is recommended. If the physical realm Halion takes more damage than the twilight realm version, the corporeality in the physical realm will go down and the corporeality in the twilight realm will go up and vice versa. Both heroic mode changes from phase one and two will still be in effect in phase three. In addition the circles created by Fiery Combustion and Soul Consumption will now overlap between realms, giving you a lot less space to move on. Assuming the Twilight Cutter didn’t get you while you were reading, we move on to the actual strategy involved in killing this purple bastid. As stated earlier this will be focused purely on the 10-man heroic version. On with the show! Halion should always be tanked smack in the middle of the room. This is critical for the twilight realm and amazingly useful for the physical realm. Stay in the same general area! For physical realm that means on the same side of the boss and for the twilight realm it means in the same quadrant. Always run them to the edge before dispelling, no matter what. A three stack circle at the edge is safer than a one stack or two stack circle in the middle. This is without a doubt the most important part of the fight to master as a misplaced circle will most likely wipe you instantly. Abilities such as Blink, Disengage and Hand of Freedom (in twilight) will help you get out of the circle quicker while Sprint, Body and Soul and Rocket Boots will help you get to the edge faster. Use these as much as possible, especially when in the twilight realm. I would presonally recommend going with three healers (one in the physical realm and two in the twilight.) It is doable with only two if you are feeling brave. Bringing a class that can crutch heal for the physical realm is also recommended for when the healer gets Combustion. The enrage timer should not be a problem either way, providing no one dies. There is nothing really special to note here. Make sure you run the Combustions to the edge and dodge the meteors. After the latter crashes you will likely have to strafe a little bit around to avoid standing in fires, but just focus on getting him to 75% as soon as possible. Given the cooldown and lasting time of Combustion there will always be two circles up. This will matter in phase three. As you enter the portal for the Twilight Realm the tank needs to pick up the boss asap and face it north. The raid then groups up to the left of the boss, a position they will keep for the rest of the fight. The tank and the raid will be moving around in different quardrants to avoid Halion breathing doom unto the raid. It is advised to have a single DPS assigned to watching the orbs and giving the move command to everyone as the cutter doesn’t always start in the same spot. It is important that everyone moves when the order goes out though, as lingering behind will almost always spell certain death. The tricky part in this phase is when Consumption and Twilight Cutter overlap (and they will pretty much every time), as you have to move diagonally towards the edge in order to not get chopped in half after dropping your circle. Heroism or Bloodlust (assuming you have one) is best used in this phase since it doesn’t work cross-realm in phase three. The raid splits in two as the physical realm group goes back up as soon as the coast is clear of cutters, to resume fighting with fire. Since the last phase is just a repeat of the first two the only “new” thing you have to be aware of is the circle overlapping the realms. 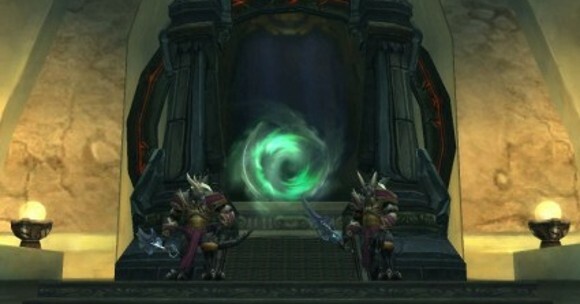 This means that there will at all times be four circles up in both realms and that it is possible to spawn them on top of unsuspecting raid members in the other realm. If the healers are on the ball it is survivable and it will probably happen a few times during progression, but there is one trick to minimizing risk. 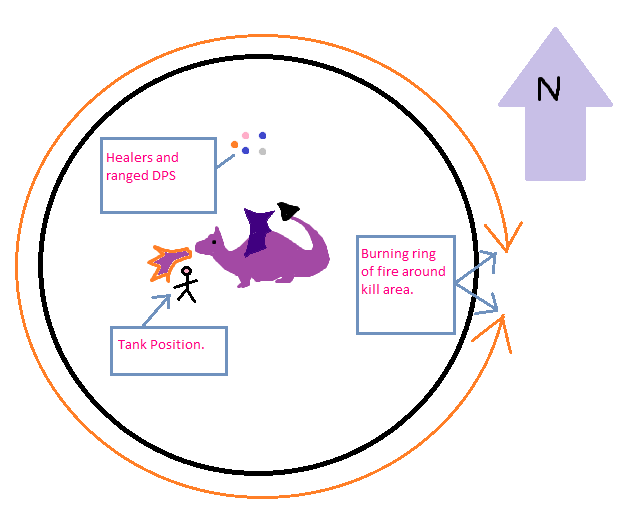 The physical realm tank should rotate Halion so that the raid always stands in the area with the fewest amount of circles. As noted earlier the corporeality mechanic is also active in this phase and has to be balanced in order to prevent tank deaths. Simply stopping DPS in a realm if the corporeality hits 40% and waiting until it goes back to 50% is a safe and easy way of dealing with it as it will never really become an issue. This phase feels like it takes forever, but just hang in there, play your best and the dragon will be giving up his precious lewts (and 10 achievement points) soon enough. I’d like to give out a huge thanks to both Tokk (for producing the guide and providing the in game screenshots) and his guild (proof reading and ensuring the tactics were perfect) for taking their time to write this amazing strategy for me. Once again, I’d like to mention that they are recruiting. They boast amazing progress (11/12 in Icecrown Citadel heroic) and are a stable and long standing guild. I’d like to personally offer them the best of luck in finishing wrath content and with their future progression in Cataclysm.